One Tomoe:Awareness (25 Chakra per turn,passive) Allows the Player to Copy Taijutsu Techniques from a selected Player,Genjutsu Costing 25 Chakra or lower are Disrupted. The Move will be added to the stats,if reported. *Acute Perception (25 Chakra,passive) All Attacks aimed at the user are Downgraded from Cant Dodge. *Two Tomoe: Perception (25 Chakra per turn,passive) Allows the Player to Copy Taijutsu/Ninjutsu from a Target.Acute Perception is activated. **Deciphered Illusion (100 Chakra,passive) The User is able to see through any Camouflages within Range:2. Unaffected by Clone Based Techniques,allowing the User to attack the targeted players. **Precognition (50 Chakra,passive)Downgrades all Attacks from Cant Guard/ Dodge,excluding Taijutsu. Exception affects One and Two Tomoe. **Illusion Piercing Eyes (###-75 chakra, passive)Releases from a Genjutsu costing ### Chakra.Can Release from an Inevitable Genjutsu once,but for +75 Chakra to the original cost. **Prolonged Movements(100 Chakra per 2 turns,passive) Target 1 Opponent,User has an additional 2 minutes to Attack/Defend the opponent. Once per opponent. **Predicted Defense (75 Chakra,Passive)Upgrades all Cant Guard/Cant Dodge Attacks used on this turn. Cannot be made inevitable. Once every three turns except if in Three Tomoe or Mangekyou. **Three Tomoe: Copy Wheel Eye (50 Chakra per turn,passive)Allows the Player to Copy Taijutsu/Ninjutsu/Genjutsu from a Target.Precognition/Deciphered Illusions are automatically activated per turn. ***Clairvoyance(125 Chakra,passive) All Attacks aimed at the user are Downgraded from Cant Block/Avoid/Interrupt. Excluding inevitable.Once every 5 Turns. ***Illusion Wheel: Pupil Hypnotism (200 Chakra) Select One Opponent,if Genjutsu successfully hits the opponent,the Player can redirect any Attack/Defense Skill from that opponent to another player. Limit is four reversals . inevitable,twice per battle. ***Clairvoyant Defense (150 Chakra,passive) Upgrades all Cant Avoid/Block Techniques, cannot be made inevitable. once every 4 turns. ***Illusion Wheel: Forced Control (125 Chakra) Allows the Player to control the target under Pupil Hypnotism for 2 turns,cannot have reversed techniques,inevitable. once per battle. *=Requires One Tomoe or Higher to use. **=Requires Two Tomoe or Higher to use. ***=Requires Three Tomoe or higher to use. -To Successfully copy a technique,please report that you copied a technique in a Buy/Sell topic. -Once the User activates more Tomoes for sharingan,the User can never return to the previous tomoes. -The amount of Techniques a Sharingan User can copy is 3 per Battle. -Moves that are automatically actived when Two or Three Tomoe Sharingan is used function like Attributes. The Player does not need to pay for those activated effects. -Sharingan Downgrade/Upgrade techniques will only affect the Player. The Downgrade effect can not help Allies defend against the Skills. 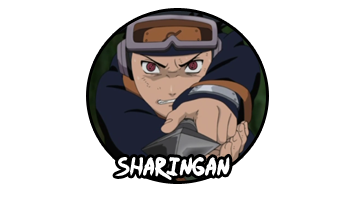 -Downgrade:Sharingan will Downgrade the Avoid Effect of Offensive Techniques aimed at the Sharingan User from the selected effect and any lower effect. Therefore if the move cant be Avoided,it will turn into Cannot Dodge,etc. -Upgrade is the Reverse of Downgrade but instead of the Opponent's Skills getting stronger, The User's Attacks will. Upgrade Dodge will Turn Cant Dodge Techniques into Cannot Avoid. Avoid:Cant Avoid->Cant Dodge->Can Dodge->Defended Automatically. Interrupt:Cant Interrupt->Cant Cancel->Can Interrupt->Defended Automatically.